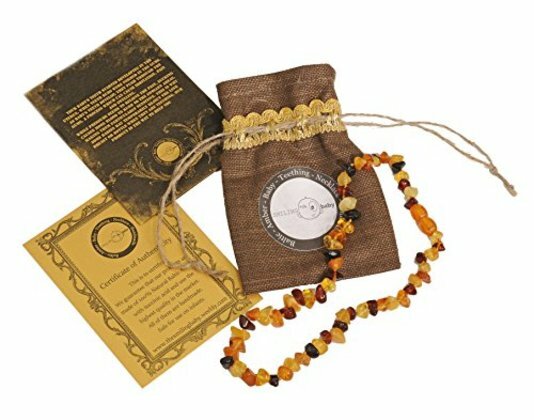 Baltic Amber Teething Necklace For Babies (Unisex)- Drooling Problem & Pain Reduce Properties. Certification Guaranteed - Nature Made - Highest Quality Handmade Jewelry. Mothers Approved Remedies. TEETHING PAIN RELIEVER - Great Alternative To Drugs. PERFECT BABY GIFT ! AMBER BEADS Are Polished For Comfort By Baltic Amber Artisans With Centuries Of Experience. HANDMADE, Safety Knotted Amber Bead, The Best Quality On The Market. BOOSTING IMMUNE SYSTEM & Anti-inflammatory Capabilities.